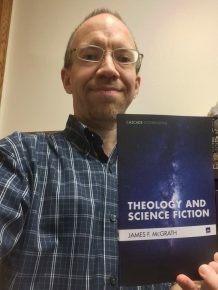 Professor of Religion James F. McGrath is both a New Testament scholar and a science fiction fan, and over the years he has noted the frequency with which they tell a similar story. In his new book, Theology and Science Fiction, McGrath documents some of the parallels in the big questions they both ask, such as: What makes us human? Where did everything come from? What awaits us in the future? What do we dare to hope for? The book is part of the Cascade Companions series, which are short texts designed to give an introduction to a subject and do it as succinctly as possible without being superficial. Theology and Science Fiction is 113 pages—six chapters of analysis and a final chapter featuring three short original science fiction stores that McGrath wrote. McGrath said the idea for a book began to take shape when he came to Butler in 2003 and was asked to teach a humanities colloquium on Religion and Science Fiction. Soon after, he got involved with several related projects, including editing a volume on religion and science fiction, co-editing a volume on religion and the long-running British sci-fi series Dr. Who, and writing an op-ed column for USA Today about the end of the TV series Lost and its religious undertones. Associate Professor of Education Katie Brooks has been awarded a $2 million U.S. Department of Education grant to train 80 current or potential teachers to become licensed to teach English Language Learning (ELL) students. The five-year grant is intended to help alleviate the chronic shortage of English as a New Language (ENL) teachers. The grant will pay for 20 college graduates who have a bachelor’s degree in a licensable area such as biology, math, social studies, world languages, or English to get both a teaching license and an ENL license. An additional 60 teachers who are already licensed will add ENL certification to their license. Twenty teachers will be from the Indianapolis area and 40 will be from Kokomo and surrounding communities. Also as part of the grant, Butler College of Education (COE) ENL, reading, special education, and early childhood faculty will collaborate with each other and with representatives of Indiana immigrant communities to integrate ENL theory, research, and practice throughout the curriculum used to train both content area and ENL teachers. The first year of the grant will include curriculum development and recruiting participants. Brooks said the priority in recruiting will be to find bilingual paraprofessionals who have a bachelor’s degree and are already teaching. “We want to help those people get their teaching license and support them along the way.” Teacher training will be the focus after that. 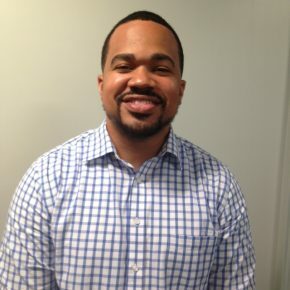 Under a five-year grant Brooks received in 2006, teachers went to the clubhouses in the apartment complexes where many immigrant students lived and led parent-involvement activities. In the process, teachers learned more about the families and families came to understand how the schools worked. That kind of collaboration will continue under this grant. Brooks said training teachers to work with students who are learning English also benefits native English speakers. 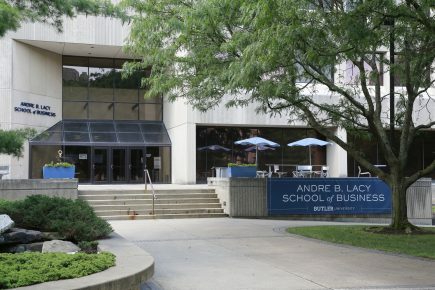 Butler University’s Lacy School of Business, which planned to establish a student-run insurance company by the beginning of the 2019–2020 academic year, has moved up the start date to May 1, 2017, Clinical Professor & Director of the Davey Risk Management and Insurance Program Zach Finn announced on September 26. -Successful fundraising, including a $15,000 grant from the Westfield Insurance Co.’s foundation and a matching gift from MJ Insurance and Michael M. Bill. MJ Insurance had already given the program $250,000 to get started. -The hiring of P. Kevin Thompson, “a heavyweight in the risk management and insurance community,” to teach in the program. Thompson previously served as counsel to Plews Shadley Racher & Braun (PSRB) LLP and President of Insurance and Risk Management Services LLC, an affiliate of the firm. Prior to joining PSRB, he served as Director of Corporate Risk Management for Eli Lilly & Company. “He’s someone who adds a lot to our brand,” Finn said. -The requisite courses—a first-in-the-nation class called Captive Feasibility and Business Plan Development, Captive Implementation, and Captive Operations—which either have started or are ready to be offered. The Butler captive insurance company will insure certain programs at Butler, perhaps including the live mascot, Butler Blue III, or physical damage to University vehicles. 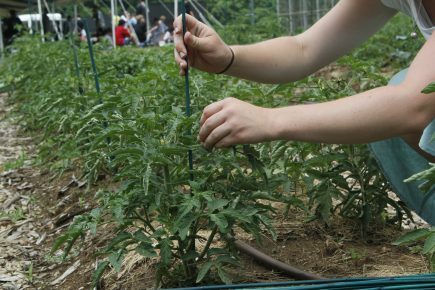 The idea is to give students hands-on experience and prepare them for an industry that expects to need tens of thousands of new employees over the next seven years to replace workers who will be retiring. Finn said there are 82 insurance risk management programs in North America that graduate 3,500 students a year—not nearly enough for the $5.7 trillion insurance industry. To get Butler’s captive insurance company ready to roll, students in the Captive Feasibility and Business Plan Development course are now selecting jurisdictions to potentially locate the company. Teams of students are developing business plans and evaluating the pluses and minuses of potential locations. The students also are working with the University to decide the kinds of coverage the company will provide and determine how the captive is adding value or lower the cost of risk to Butler. They’ll present their findings in front of a panel of industry experts, then spend the spring semester starting the company. The idea is to give students hands-on experience and prepare them for an industry that expects to need tens of thousands of new employees over the next seven years to replace workers who will be retiring. Butler University has been named one of the 26 healthiest colleges in the country by Greatist.com, a website devoted to healthy living. For the second consecutive year, Butler University has been ranked as the Most Innovative School among Midwestern Regional Universities, according to the 2017 edition of U.S. News and World Report Best Colleges, released today. This category focuses on innovation in curricula, campus life, technology, and facilities and among faculty and students. Butler was also recognized in the categories of Best Undergraduate Teaching and the Best Colleges for Veterans. Butler was ranked #2 among Midwest Regional Universities for the seventh consecutive year, but saw its overall score increase from 95 to 98 out of 100. The University also saw an improvement in its peer assessment score. “This score is especially gratifying because it affirms that our fellow higher-education leaders know that faculty, staff, and students at Butler University are doing great things,” said President James M. Danko. Butler was ranked #2 among Midwest Regional Universities for the seventh consecutive year, but saw its overall score increase from 95 to 98 out of 100. Butler University officially cut the ribbon on September 15 to open Fairview House, its new $43 million, 633-bed residence hall located along Sunset Avenue. The residence hall features three- and four-bedroom pods with two students to a room. Each pair of students shares a bathroom, and each has his or her own sink and large closet. Fairview House is also equipped with the kinds of amenities that today’s students demand, including kitchenettes and living rooms in each pod, recreation and media lounges, soft spaces for study, and laundry facilities on each floor. The residence hall also has a large multipurpose room—“a living room for the campus”—that will be used for conferences, events, and other gatherings. “It all adds up to living conditions that are on par with our classroom offerings, giving Butler students the best of both worlds,” Keith Burks, Chair of Butler’s Board of Trustees, told an audience of students, faculty, staff, trustees, and dignitaries. 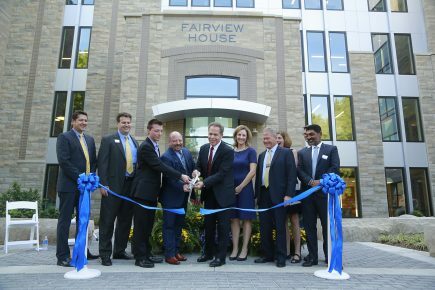 Fairview House is the result of a partnership between Butler University and American Campus Communities. Under the agreement, American Campus built and will maintain the facility, while Butler will provide staff to manage the building. 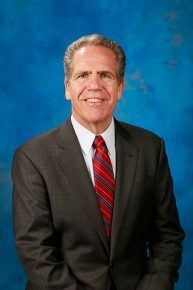 Butler President James M. Danko said the partnership enabled Butler “to concentrate on our core mission: educating our students. ACC’s investment allows the University to focus and prioritize resources toward the development of new, state-of-the-art academic space to better serve students. American Campus Communities is the nation’s largest developer, owner and manager of high-quality student housing communities. The company has projects on 96 campuses nationwide, including Princeton University, the University of Southern California, Texas A&M University, Arizona State University and more. Associate Professor of Theatre Rob Koharchik and Butler Theatre alumnus Jeffery Martin ’93 each received one of the "surprise" $10,000 awards given by The Indianapolis Foundation to Indianapolis-based organizations and individuals on August 27. Koharchik and Martin were recognized under the category “Indy Professional Theatre MVPs,” creative professionals whose work in theater contributes to the vibrancy of the cultural community and the strength of our city. More information about the awards is here. Koharchik is the set designer for Butler Theatre, which means he’s in charge of everything from the look of the “room” that’s depicted onstage to what items sit on the coffee table. If you’ve seen a Butler Theatre show over the past nine years, or perhaps a production of Shakespeare by the Heartland Actors Repertory Theatre, or something at the Indiana Repertory Theatre, then you’ve probably seen a set Koharchik designed. His credits also include work at Philadelphia’s Walnut Street Theatre and the Geva Theatre Center in Rochester, New York. 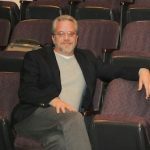 Martin serves as the full-time Technical Director for the Phoenix Theatre. 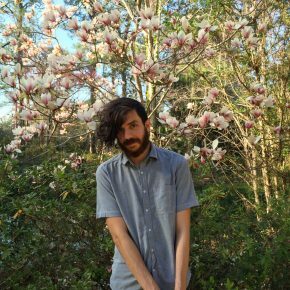 He has designed set and lights with The Phoenix Theatre, NoExit Performance, Know No Stranger, and Theatre on the Square, and he directs and designs with Young Actors Theatre. Most recently, he produced and directed one of the top-selling shows for the Indianapolis Fringe, Kurt Vonnegut's: God Bless You Dr. Kevorkian. A New Director of Admission for Butler? Great Scott! The first notable thing about Butler’s new Director of Admission is his name—Delorean J. Menifee. Which, you’d think, would result in any number of “Great Scott!”/“1.21 gigawatts”/”Roads? Where we’re going, we don’t need roads” jokes. Beyond his unusual name, Menifee brings a lot to Butler, Vice President of Enrollment Management Lori Greene said. Menifee, who goes by DJ, comes to Butler from Knox College in Galesburg, Illinois, where he was Associate Director of Admission for the past three years. 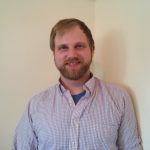 He also has worked as a Regional Admissions Counselor at Western Illinois University, Assistant Director of Admissions at Ball State University, and Assistant Director of Admissions at Lees-McRae College, his alma mater. At Lees-McRae, Menifee studied business. In his senior year, he was helping the Chair of the business school make a pitch to the Board of Visitors about how its members could help grow the business program. Menifee didn’t know it, but Lees-McRae’s Vice President of Enrollment Management was in the room. Menifee took the offer. He thought admissions was an interesting field, but he had no intention of pursuing it. But two weeks before graduation, the Vice President of Enrollment Management invited him to take a walk. The walk led to the President’s Office, where they made him a job offer. Coming to Butler, Menifee said he feels ready to be a Director of Admission. 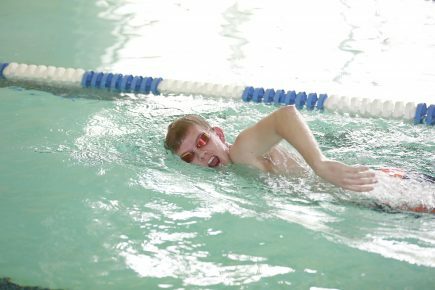 He said over his career, he has learned the team building, strategy, and execution needed to meet enrollment goals. He also wanted to work at a university that valued liberal arts and experiential education. Menifee described himself as “family-oriented”—he and his wife, Anabel, have an 8-year old daughter, Kaydence, a 3-year-old son, Kyrie, and a new addition to the family to come in the coming weeks. He said the idea of family extends to the team he works with. 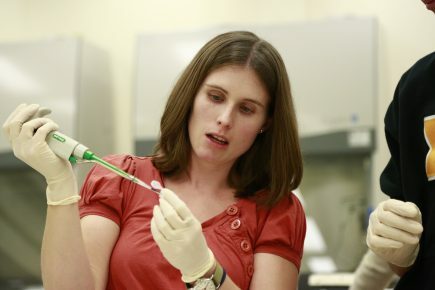 Assistant Professor of Biology Lindsay Lewellyn has been awarded a $410,656 National Institutes of Health grant to study egg development in fruit flies, which ultimately could lead to breakthroughs in the area of human infertility. The money for the project, which is officially called “The growth of the germline ring canals during Drosophila melanogaster oogenesis,” will be used to pay for students to work in the lab over the summer, presenting findings at research conferences, hiring a full-time research technician during the academic year, and supplies. 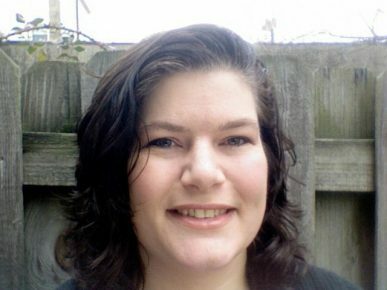 Lewellyn began studying fruit flies in 2010 while doing her post-doctoral research at the University of Chicago. She joined the Butler faculty in fall 2013. Intercellular bridges are found in organisms from fruit flies to mammals, so “by understanding more about how these structures are formed and how they develop, it could give us insight into potential causes for infertility in humans,” she said. Infertility affects millions of Americans each year, and many of the causes are not known.